Can Philanthropy Actually Help Your Bottom Line? Awaken your thinking about corporate social responsibility (CSR) and business philanthropy. This e-book brief shows you how to generate greater performance and profits at your firm with strategic philanthropy. Discover how to improve your community, improve your profits and performance, and reach your philanthropic potential. This brief introduces you to the untapped power of strategic corporate social responsibility. Stop! 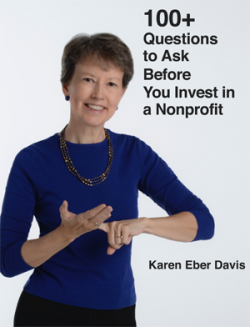 Before you invest your time or resources in a nonprofit organization, ask questions. Why? To save time, money, and aggravation. This e-book is chock full of ideas about what to ask in a dozen categories. Read it to find questions to ask to decide whether to donate, volunteer, join the board, or become a staff member. Ask to find out if your gifts will make a difference. Ask to find the excellent organizations to help you change the world. Your organization doesn’t just need great grants –it needs Grant-tastic ones, that is, proposals that get funded. This booklet with its clear advice and easy to use format provides you with the hints, tips, and tricks you need to write and win grants. Nonprofits spend half or more of their resources on people to acquire their time. By streamlining and improving the time management at your organization, you create more of your mission. Time Management for Nonprofit Leaders includes 121 Time-tastic Tips to help you get the most out of your most important resource. Take the challenge: Implement 50 tips and save the equivalent of a part-time staff member. Nominated for the 2011 Terry McAdams Award.